... the gunmaker master Eberhard Klett is leading the family business under the company name "Klett Custom Guns" in Borken, Germany. His gunmaker business provides first class equipment which is used by him and his employees — also first class trained gunmaker with many years of experience — to work even on most precious guns. 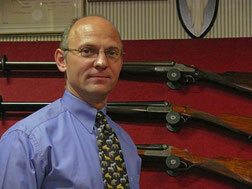 At Waffen Klett's salesroom you will find a large selection of sporting guns, to meet all your requirements. You will find guns of world widely known companies like BLASER, HEYM, KRIEGHOFF and MERKEL, which are specialised in combined guns as well as the finest english side-by-side shotguns: from box lock models without ejector up to side-lock models of finest quality, if hammer shotgun or bar-in-wood — the selection is first class. Due to very good connection to Great Britain for many years, the most unusual models can be provided upon customers request; great importance is attached to first class condition of the guns. Guns are made to customer measurements and provide full guarantee by the own workshop.